- Lace Top Toe Covers- each pack comes with 2 pairs and are made for sling backs. The lace covers your toes and then there's a clear, thin plastic strap that goes behind your heel where the sling back is. A bit of the lace may show but it's ok since it's so fab! - Peep Toe- each pack comes with a pair of stretchy socks that don't have any cover for your toes at all. Everything else gets covered so you can show off your pedicure! - Knee High with cotton sole- this works for kinds of shoes but will look cute with heels as it is covers your legs up until your knees. The extra cotton sole padding makes it breathable and gives it a nice oomph of comfort. - Foot Cover with cotton sole- for your everyday heel, these foot covers have the extra cotton sole to give you the perfect comfort you're looking for. If you're more of a flats/ sneakers kind of gal, these two options will be amazing to add to your sock collection. The Athletics cushioned foot covers are perfect! These are as low-cut as you can go and they provide the coverage you need. 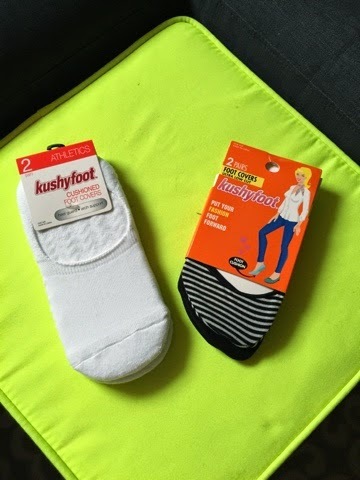 I love to wear my flats so the KushyFoot foot covers are a new staple in my sock drawer. Each pack comes in 2 pairs - shown here is the black/white stripe and a solid black. Tip: These are also great to put in your carry-on or purse if you have to walk barefoot at the airport security.